The Best Gutter Guard Installation in New England! Gutterglove Pro is ranked #1 by many high profile consumer reporting agencies. Provides a 100% lifetime no clog warranty. Its stainless steel mesh filter won’t allow anything but water into your gutters, not even dirt! Click here to learn more. Heavy gauge cast aluminum housing is the strongest in the industry (no plastic or vinyl here). Prevents pests from nesting inside. Puts an end to climbing ladders, maintenance free which grants peace of mind. 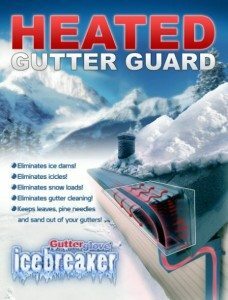 AmeriGutter proudly installs Gutterglove the #1 rated Gutter Guard in the US! Gutterglove’s stainless steel filter keeps out everything but water GUARANTEED!. 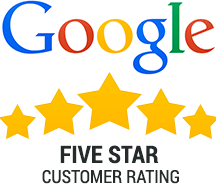 Rated #1 by several consumer reporting agencies. Gutterglove with its cast aluminum housing is the strongest gutter cover on the market today, unlike our competition which uses a vinyl or light gauge aluminum housing. 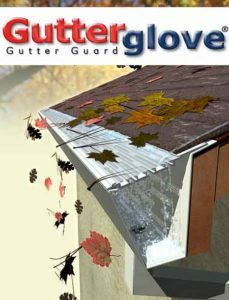 With Gutterglove nothing but water can enter your gutters, no birds, no bees, not even dirt. Gutterglove doesn’t’ attach to your roof and it can be installed on new or existing gutters. High quality gutter guard installation is imperative. Don’t settle for less than the best. As a business owner working in the RI, Ma & Ct area I want to provide a gutter guard product to my customers that will not only satisfy there needs, but will also save my company time and money from having to return to unsatisfied customers homes to unclog their gutters. We’ve tried the so called reverse curve systems like Gutter Helmet*and Leafguard*. We spent almost $9000.00 on a machine to make covers almost identical to Gutter Helmet but with in 6 mouths customers we’re calling us back with complaints. One of the problems we identified was built up gook on the front curve of the Leafguard preventing the flow of water around the curve into the gutter, this curve would need to be periodically scrubbed clean (not exactly what I would call maintenance free). Also the rain would pick up debris and the debris would flow with the water around the gutter helmet curve and into the gutter clogging the down spouts. The cure that Leafguard & Gutter Helmet have to prevent frequent clogging is to put a large 3×4 commercial down spout on the house which is costly, looks unnatural large on a residential home, and the debris that flows down the 3×4 down spout would then clog underground french drains. Some other problems included small birds squeezing threw the small Leaf Guard opening and nest inside the gutters, bees nesting inside, damaged roofs and voided roof shingle warranty’s from lifting the shingles to install the gutter guards, and complaints about the size of the system or the unconventional look taking away from the curb appeal of there homes. Gutter guard installation was never meant to be like this. We also tried the cheaper mesh type covers , but these system would collapse with the weight of snow and clog almost as quickly as a gutter without covers. The reason for this is the small debris like pine needles and maple seeds can get threw the small hole and even a small amount of this debris can make a “rats nest’ type clog over the hole for the down spout. 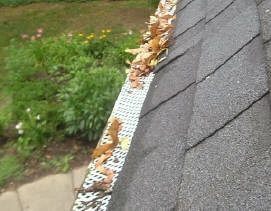 We were just about ready to give up on gutter guards when I discover product called Leaffilter. Leaffilter with a stainless steel filter solved all the above problems but had a couple of short comings, one is the filter is not attached at the factory but instead need to be glued on with caulking on the job site by the installer, we have had a number of filters that have come loose and falling off the housing. Second its that the housing is made of vinyl and tends to warp in the heat of the sun, finally because the product sits flat on top of the gutter it would collect debris on top of it causing water to run off the top. Pollen would also cake up on top and the filter would need to be scrubbed clean. We’ve been installing filtered covers for over fifteen years now and we no longer have any angry customers. I’m proud to say we now have Gutterglove, the very best gutter guard on the market to offer our customers and it’s not just me saying that, it’s several leading independent consumer reporting agency’s as well! Mesh Gutter Guards collect debris in the holes and clog very frequently. Many of our competitors use a very general and unspecialized type of mesh system often with vinyl. The effectiveness of such systems is brittle at best. 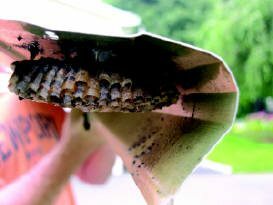 The last thing you would expect from such a popular product after a couple of years would be to find a hive of unwanted pests that pose a danger to the occupants and visitors of your home. Gutterglove Pro won’t allow any type of pest to make its own home in your gutters. Leaf Guard builds up with goop which prevents water flow and need to be scrubbed periodically. Leaf Guard is pretty popular in New England and especially in Connecticut but what homeowners don’t like to find out is that their leaf guard system has failed to eliminate debris accumulation thus leading to failure over time and the possible consequences that come with gutter failure. 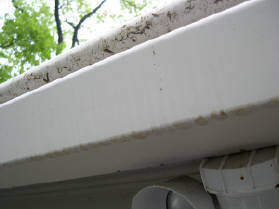 This type of gutter system will also need you to get on a ladder and give them a nice cleaning from time to time. 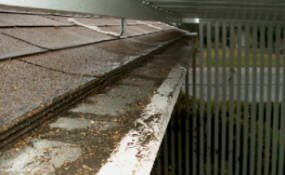 Leaffilter sits flat on top of the gutter causing debris to sit on top and clog the filter with pine needles, pollen, moss etc. Weak plastic housing. So although this gutter cover system may filter leaves like its name suggests, it’s not so great at filtering the smaller particles of debris which Gutterglove Pro’s 50 micron stainless steel mesh excels at.